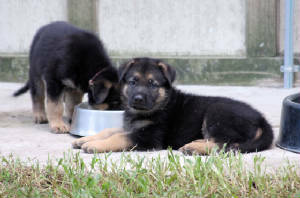 Vom Weiland German shepherd breeders have been producing top quality tan and black German shepherd puppies for sale from Czech bred German shepherd dogs imported from Slovakia since 2006. 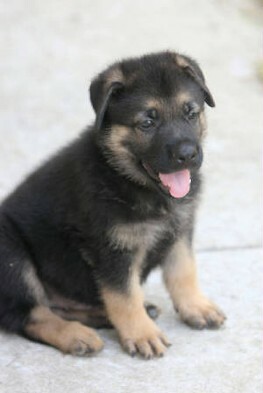 We invite you to submit a deposit on a German shepherd puppy from any of our future litters. See details on how your deposit will be processed on our Guarantee page. If you do not get a puppy from the litter that you chose, your deposit will be refunded or you can choose to apply it to a future litter. 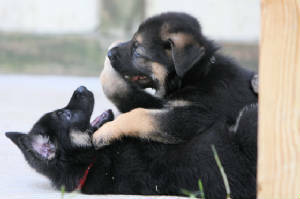 Our tan and black German shepherd puppies for sale are raised in our home, and played with daily. 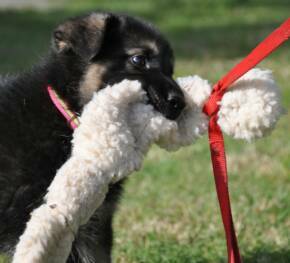 Our German shepherds are crate trained by 8 weeks of age, and have played with balls, tugs and other toys, starting at 4 weeks of age. 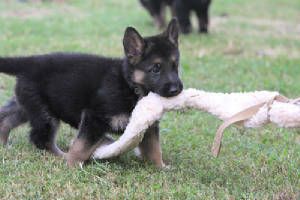 This heightens each German shepherd puppy's drive, willingness to learn and learning curve. 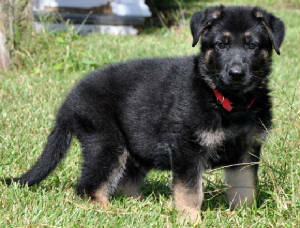 As ethical German shepherd breeders we use only the best German shepherd stud dogs and german shepherd females we can acquire. 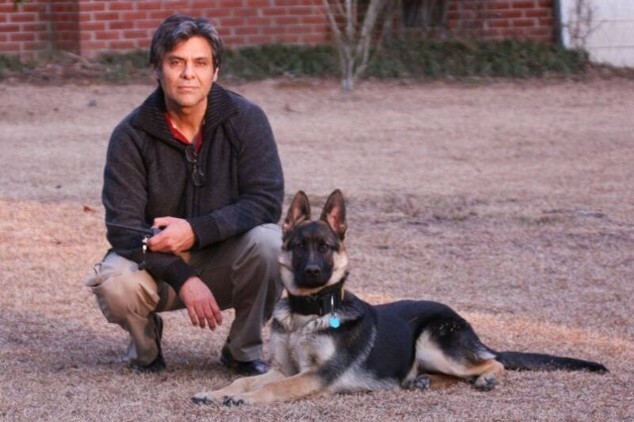 We use German shepherd dogs with great drive, extreme intelligence, working titles, and the best hips and elbows. 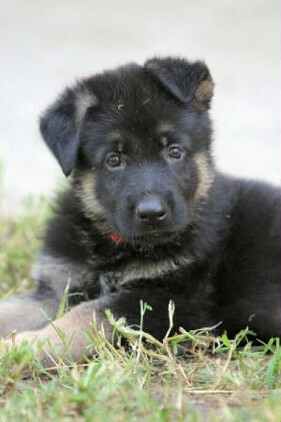 We feel confident in our German shepherd puppies for sale and give a comprehensive guarantee for our German shepherds' hips and elbows. 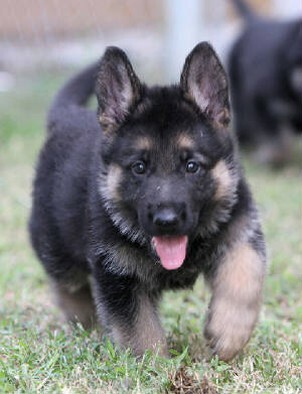 We strive to breed the best working German shepherds possible. 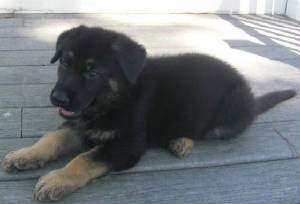 You can click on our previous litters to see individual photographs of each of our German shepherd puppies, as well as links to the webpage for that individual puppy, which we maintain for each owner of our puppies, to add photographs and progress notes on each German shepherd puppy's progress. 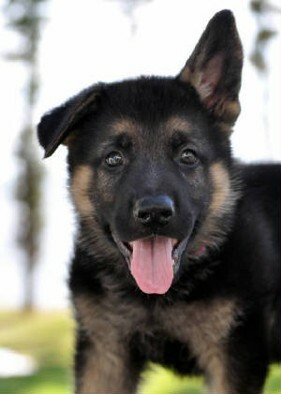 We register each puppy with American Kennel Club (AKC) shortly after the birth of each litter of German shepherd puppies. 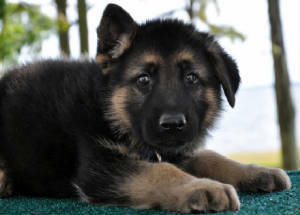 Each of our German Shepherd puppies leaves us at 8-9 weeks mostly housebroken and with: ear tattoo, puppy training, his AKC registration, AKC litter certificate, your written health guarantee, documentation on all worming, vaccinations and daily puppy notes from 4 to 9 weeks, a brand new copy of one of the favorite toys that the GSD puppy is used to playing with. 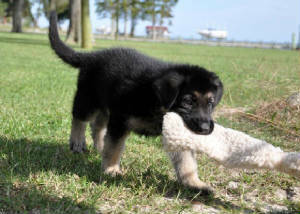 You can pick up your German shepherd puppy from our home, or have him shipped by Delta Dash or American Airlines. It costs a little over $300. 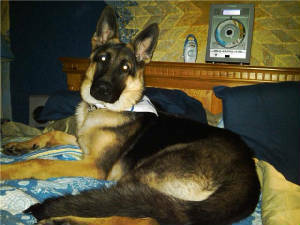 to ship a 8-9 week old German shepherd to anywhere in continental U.S.A., including the crate and required health certificate. 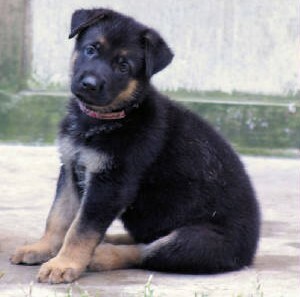 You may choose your German shepherd puppy's name from a list of choices. 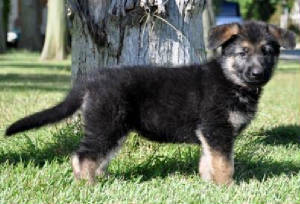 See videos of our Vom Weiland German Shepherd puppies for sale in training on YouTube.